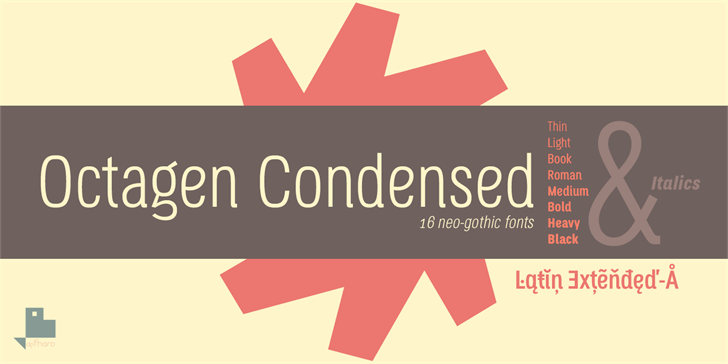 FULL VERSIONS & COMMERCIAL LICENSES: https://defharo.com/fonts/octagen-condensed/Octagen is a family of 16 condensed Sans Serif fonts of geometric construction and neo-Gothic style with short descenders and a humanistic finish in the curves and auctions of the tiny letters to avoid the coldness of the grotesque typographies, providing expressiveness, energy, warmth and docility , resulting in a friendly typography with a lot of personality and readability, specially drawn for the composition of short and medium texts, signage or headlines where horizontal space saving is needed. 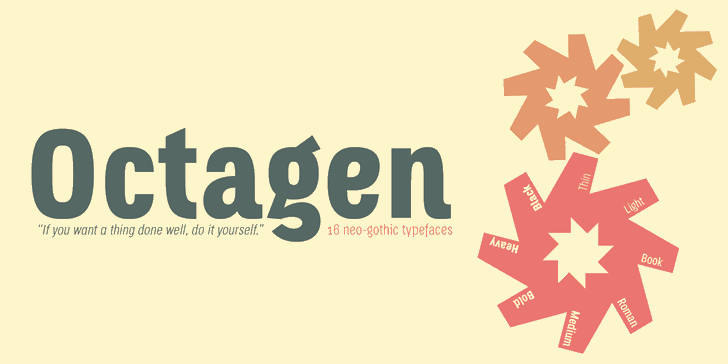 Octagen is a family of condensed Sans Serif fonts of geometric construction and neo-Gothic style with short descenders and a humanistic finish in the curves and auctions of letters, to avoid the coldness of the grotesque typographies, providing expressiveness, energy, warmth and docility, which results in a friendly typography with a lot of personality and readability, especially drawn for the composition, for example, of short and medium texts, signage or headlines. Personal use only (FFP)! Leer / Read: <br>https://defharo.com/product-usage-agreement-ffp/ <br> <br>Commercial license. 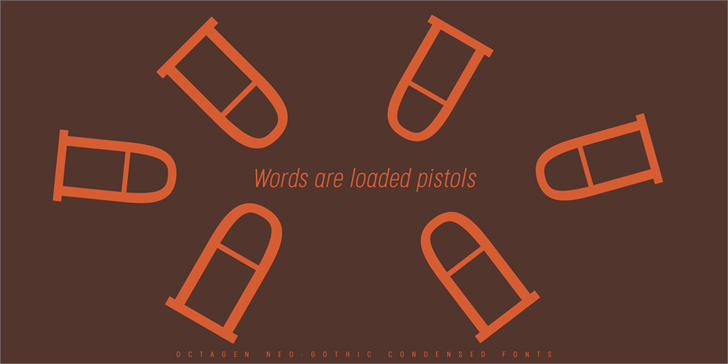 READ: https://defharo.com/terms-and-conditions-commercial-fonts/ <br> <br>Please visit www.defharo.com to buy a commercial license. Octagen Light is a trademark of deFharo. 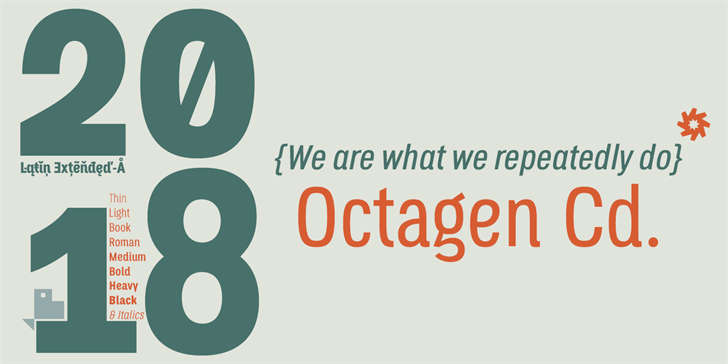 Octagen is a family of condensed Sans Serif fonts of geometric construction and neo-Gothic style with short descenders and a humanistic finish in the curves and auctions of letters, to avoid the coldness of the grotesque typographies, providing expressiveness, energy, warmth and docility, which results in a friendly typography with a lot of personality and readability, especially drawn for the composition, for example, of short and medium texts, signage or headlines. 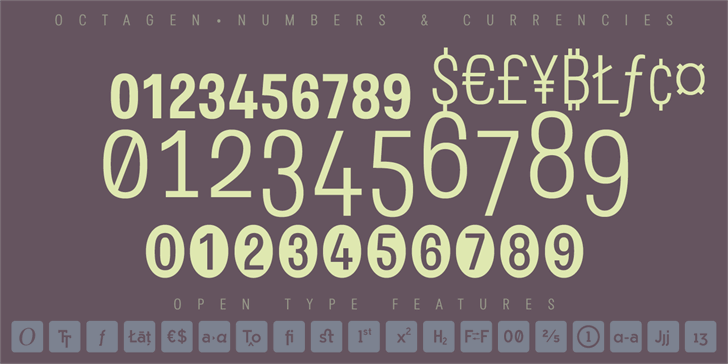 <br> <br>The typography has 529 glyphs (Latin Extended-A) with advanced OpenType functions, several number games, a complete set of neutral-style alternative lower case letters and the Bitcoin symbol. <br> <br>For Octagen cursive styles I used a set of lowercase letters without terminal finishes, more neutral than the regular versions, this being compensated by the expressiveness of the italics inclination, thus achieving important morphological, coherent differences within the conceptual development of this typographic family. 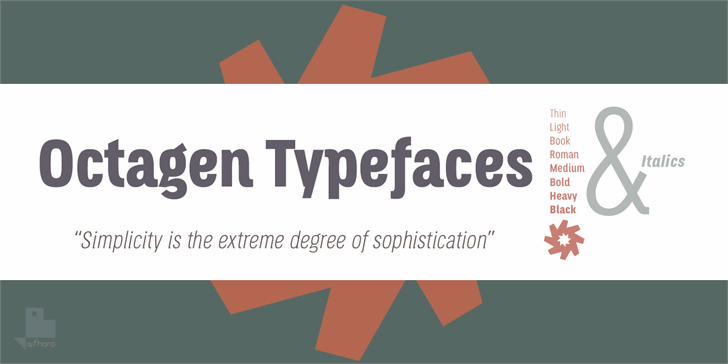 Octagen Roman Italic is a trademark of deFharo. 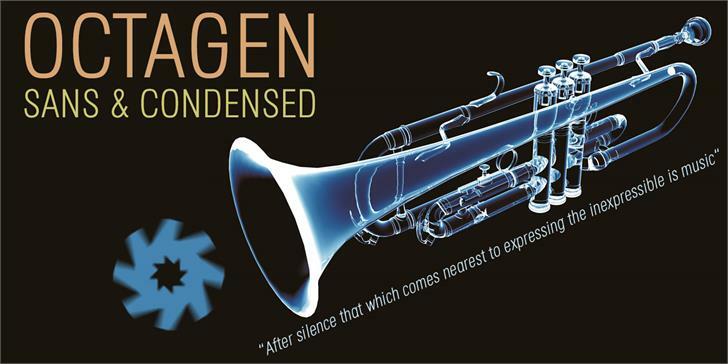 Octagen Roman is a trademark of deFharo.